Gigi and Katy is a true story about two French bulldogs who are mother and daughter. Katy is the mother, and Gigi is the daughter. The message of the story is about worth. All individuals have value because of what they contribute to our lives by just being who they are. 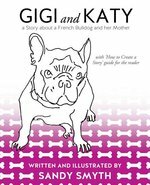 Gigi's mother Katy, besides being a good pet, has a career as a well-trained pet therapy dog, while Gigi is just a good pet. Gigi has a compromised immune system, which causes her to have severe allergies that keep her from being a show dog or a pet therapy dog. Gigi's worth is her spirit and the joy she brings to her owners who have no children. At the end of the story, the reader is invited to write a story about their own pets on pages provided. Components of what makes a good story and an outline to follow for creating a story are included. SANDY SMYTH is a certiﬁed grief specialist and art workshop facilitator. She is the author of six books. M.A.R., Pastoral/Theological Studies, Yale Divinity School; M.A.R.S., Religious Studies, Sacred Heart University; B.A., Art, Elmira College.